CD review: "Eat or Be Eaten"
This review first appeared in the January 29, 1986 issue of The Daily Aztec. If you've never listened to Firesign Theatre, do yourself a favor and start now. Around since the late '60s, this troupe has an approach to comedy that really has to be heard to be appreciated. Actually, forget the word "appreciated" right there. Let's go with "experienced." Firesign Theatre is something you experience. And you can't really explain them to someone who hasn't heard them  it's like trying to describe colors to the blind. 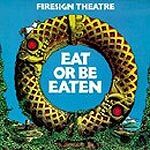 Those who are familiar with Firesign Theatre will understand the format; it's not skits so much as a play, or more precisely, a satire of old-school radio dramas. On "Eat or Be Eaten," the premise of the album is a computer game that creates an artificial environment/hallucination in the form of a small town in the deep south. The gameplay, such as it is, revolves around solving a mystery based on clues provided by the computer-generated characters. Highlights include a gun store commercial, and an advertisement for the National Toilet, a take-off on the current radio commercials for the National Enquirer: "John Kennedy came back to Earth in a spaceship with a super new diet  I read it in the Toilet!" Troupe originals Phil Proctor, Peter Bergman and Phil Austin are joined by Laura Quinn, and each fill out a handful of characters apiece. Firesign's patented semantic slights of hand abound  meaning that, as with their earlier albums, you can listen to this over and again and pick up something new each time.